Here’s a terrific way of pulling together all your points of contact and exposure on social media, new media and your own websites. It will give you one big, active sheet that will delight you if you’re a visual thinker – it’s Favorites or Bookmarks on visual steroids. And it won’t cost you a cent. TreeSheets uses a nested grid with clustering approach to organizing information. Any cell can contain text, a picture, a web hyperlink, the path to a program in your PC. Or, a cell can contain more cells, and so on recursively which is where the ‘Tree’ in the name originates. Selected groups of cells can be zoomed into almost instantly, for easy viewing, or left zoomed out so that they take little space on the screen. A web address in a cell can be opened easily by selecting the cell and pressing F5. I’ve colored these green in the example above, for easy recognition. Together these capabilities provide a most powerful combination. First download TreeSheets from treesheets.com and install it – it’s free and runs on Windows, Mac and Linux. Then start a new TreeSheet – you can accept the 10 x 10 grid that it always proposes to start with – and start building. Visit each site that is important to you and group those that are related. So you might start with Twitter, for example, and visit associated sites like Tweetake, FriendorFollow, SocialOomph, and Twibes – whatever you use. Nearly all have a graphic somewhere on their web page that you can copy and paste into your TreeSheet: Right-click the image you want, and select Copy image. Then click a cell in your new TreeSheet and paste – the image will appear. You can scale it from within TreeSheets, but if you want just a portion of an image you may have to edit the image in external software. Under the image, you will group related links and this will give you a quick visual cue for instant recognition. You can click and type to enter text in a cell, or you can drag the favicon icon from your browser address bar to a cell. It will enter the URL for you. To go to that web page later, click on the cell and press the F5 function key. What this means is that you save a lot of time by having a collection of associated web shortcuts keyed visually by images and ready for immediately opening the appropriate social networking or new media site. I tried many ways to tame the sea of links I swim in each day. I used to do this with shortcuts in folders, each folder being for one of the groups (say, Twitter-connected or Google-connected services) but you cannot see much at one time and there are few visual clues other than icons. 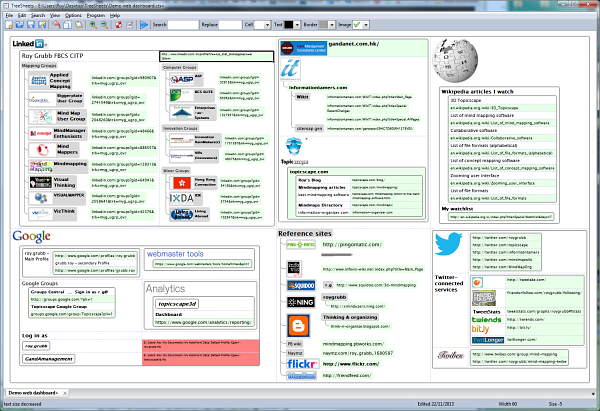 Then I built a mind map with MindManager. That worked for a while, but so much of the map is space that you couldn’t view it all at one time, so to use it, I had to scroll, zoom and fold branches. Also – and this turned out to be crucial – MindManager was relatively slow to start up. Fair enough, it does many things that TreeSheets cannot, but for this I didn’t need them, and TreeSheets starts up *very* quickly: less than a second on my PC, even with all the images. A web page could do the same job, of course, but with the time fiddling with tables or CSS and working on it every time something new came along, it’s just not flexible enough. A TreeSheet is much more intuitive and changes can be made very quickly. And that’s it. Flip this on the screen at the start of the day, and run through your regular visits to sites and you’ll save yourself a bunch of time and effort.